You know the saying, “A picture is worth a thousand words”? Well, what if that picture was of a thousand words? That is sort of the idea of wordmapping, also known as mind mapping. It’s when you write down a central idea or word, and then use bubbles (or whatever shape you like) to show how that idea can connect to another and another, etc. There are tons of ways to do it, and there is even an app that will do it for you! I have always called it word mapping and it’s been my first go-to tool for design since the dawn of time. Or at least since back in the 1990’s, after I had been designing a few years. I would be in a sales meeting for the company I worked at (Patrick Media group, now Lamar Outdoor), and during the “brainstorming” part would write down the words that seemed to make the most sense for whatever we were working on. It was faster to just write those key words then try and take notes. Then I would take each of those words and start writing others that were similar or somehow related. It helped me to find connections between ideas. Over the years I have used this method to design – and write copy- for EVERYTHING from logos to brochures and websites. I have also used it for PLANNING, and I have to say it’s a very powerful planning tool. In my humble opinion, the reason it’s so effective is that it is about capturing the ideas themselves and finding how they relate to other ideas, without the extras (marketing and sales descriptions). Design is 80% thinking, 20% doing – and if I reverse that, and spend 80% of my time doing with only 20% of thought behind it, I may get something that looks good, but it won’t be nearly as effective. Mapping shows where places are, and we use it to find our way to those places. In doing that, we see where we are in relation to those places. That’s what word mapping does. We start with ideas written out on page, but we are able to see where those ideas are in relation to other ideas. 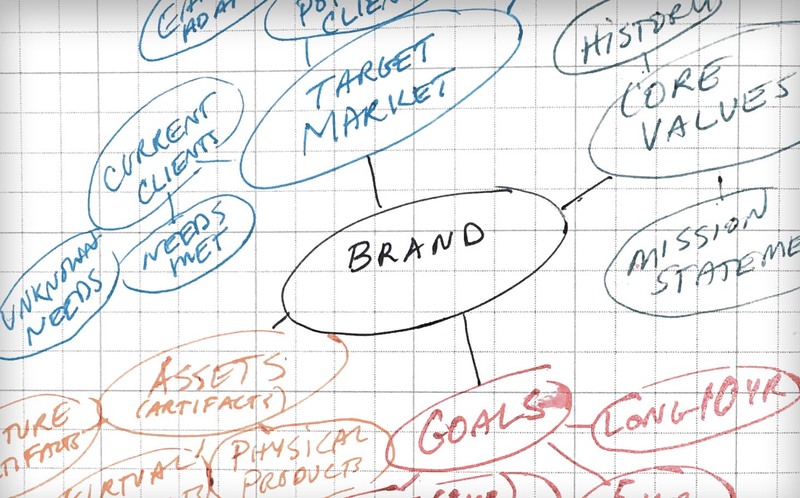 From there we can create a strategy (plan) for something big, like an entire branding campaign, or something very specific, like a brochure, or presentation or website. And it’s fun! It’s okay to have fun while you work, right? If not, then I’m doing it all wrong! If it’s been a while since you’ve done this, give it a try; and go ahead and break out the colored pens.